The festival took the name of the Glastonbury Festival for Contemporary Performing Arts for the first time, to reflect the diversity of attractions within the Festival. 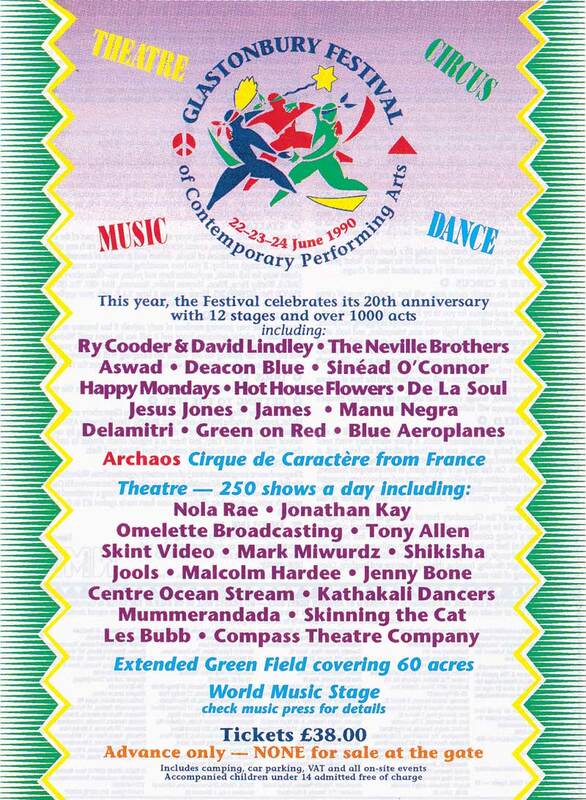 It was the twentieth anniversary of the first Festival but unfortunately ended with a confrontation between the security teams and travellers who were looting the emptying festival site. This resulted in 235 arrests and £50,000 worth of damage to property and hired plant. 1990 was the first year that a professional car parking team was employed to encourage the best use of space. Donations of £100,000 were made to CND and other local charities. Acts included: The Cure, Happy Mondays, Sinead O’Connor and World Party. Attendance: 70,000. Tickets: £38. Programmes: £3.